Luray, located in Page County, developed as a county commercial center soon after the town’s establishment in 1812. 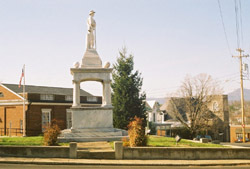 In 1831, Luray became the county seat and later experienced considerable prosperity following the construction of the Shenandoah Valley Railroad through the town in 1881. With the discovery and opening of nearby natural attraction Luray Caverns in the 1880s and the development of the Shenandoah National Park and Skyline Drive in the 1920s and 1930s, the town grew well into the 20th century. Luray was platted around 1812 as a double file of 18 lots extending along Main Street (then known as Peter Street) from Hawksbill Creek to the present Court Street. Main Street was a section of the road that passed through the Blue Ridge and Massanutten Mountain to connect the Page Valley to the Piedmont and the Shenandoah Valley proper. Documented and surviving early buildings indicate that the town’s initial building stock was primarily of log construction. The oldest extant dwelling is the log house of William R. Almond, which survives incorporated into the Almond-Amiss Building at 101 W. Main Street. With the completion of the Page County Courthouse in 1833, commercial activity was stimulated with the development of hotels and law offices, as well as small-scale industrial development such as blacksmithing and tanning. Three residential-commercial buildings survive from this era: the 1835 Yager Building at 230-232 W. Main; the 1830s Jordon-McKim House at 221 W. Main; and the circa 1850 Hotel Laurence at 301 W. Main. The commercial function of Luray’s antebellum commercial-residential buildings took the form of general merchandising to supply townspeople and area farmers with staple and luxury goods. The 1880s were an important period in the development of Luray. In 1881, the Shenandoah Railroad built its line through town, setting off a wave of industrial and residential construction. According to the Federal census, the town’s population more than doubled between 1880 and 1890, from 630 to 1,386. Luray’s hotels were sustained by the popularity of nearby Luray Caverns—according to period reports, 15,000 tourists visited the cave annually in the early 1880s. The development of the Shenandoah National Park and the Skyline Drive in the 1920s and 1930s attracted the motoring public to the area and provided clientele for Luray’s grandest hotel, the Mimslyn Inn, which was constructed in 1930-31. 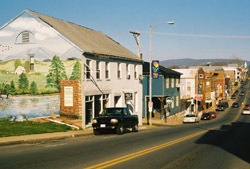 With the construction of the Route 211 by-pass in the 1970s, diverting travelers around the town, and the arrival of large national retailers to the west of town, downtown Luray started to languish as a retail center. However, efforts are underway to change this situation. Several buildings have been rehabilitated, including the train station, the former Cave’s Hardware Store and the former Graves Motor Company, into new retail spaces. The Luray-Hawksbill Greenway provides a fitness and walking trail for visitors and residents. The historic Mimslyn Inn at 401 West Main Street has been graciously rehabilitated. In 2004, the Luray Downtown Initiative, Inc. was formed to lead the downtown revitalization efforts, and that same year, Luray was designated a Virginia Main Street community. 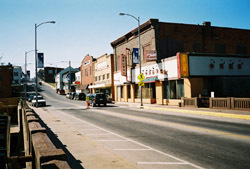 The Luray Downtown Historic District is located along Main, Court and Broad sts. The Luray Downtown Initiative is located at 127 E. Main St. and is open from 9:00am to 5:00pm, Monday-Friday. For more information about shopping, dining, and events in downtown Luray, call the Luray Downtown Initiative at 540-743-7700.